Pratchett’s vision didn’t quite come to pass, though he did, in the end, die at home, as he desired. 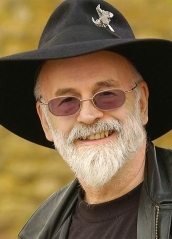 Best known for his Discworld series of fantasy novels, Pratchett was knighted in 2009. Over the course of his career he amassed a fiercely devoted following, which only seemed to increase with each successive book. “All who read him know,” says Finlay, “Discworld was his vehicle to satirise this world: he did so brilliantly, with great skill, enormous humour, and constant invention.” The penultimate book in the series appeared in 2013; the 41st and final volume, entitled The Shepherd’s Crown, is due to be published later this year.